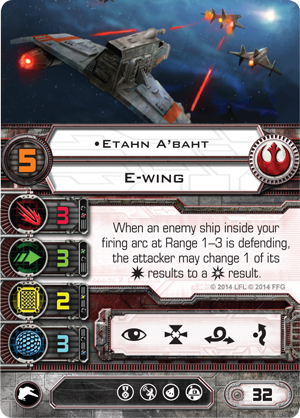 As we were surprised last Friday, the X-Wing Miniatures Wave 4 ships have been announced. I'd really kind of hoped to talk about this before now, but I ended up having to work 8 hours on Saturday, and subsequently spent my time waiting on my oil change today shooting out resumes, so now is kind of the first chance I've had to sit down and write much on the topic. 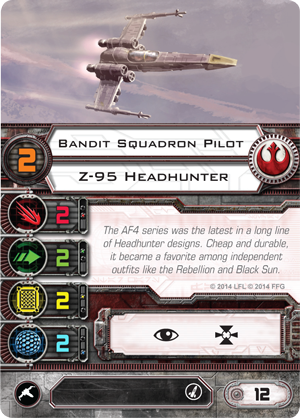 Not much was revealed about the Defender and the Phantom, but we already have a couple of cards revealed concerning the E-Wing and the Z-95 Headhunter. The Headhunter, as I'm sure many of y'all know, was the prequel to the X-Wing. As such, it looks kinda similar, but it was a less capable fighter and was sorta the Toyota to the X-Wing's Lexus, if you catch my drift. Or the Nissan to the X-Wing's Infinity, you dig? Ok, so the statline is gonna be easy to remember, right? I tell ya, I know it's early and everything, but I think that folks who are predominantly Rebel players are going to want to pick up several of these guys. I know that you could run a Rebel Swarm with A-Wings kinda, but with these guys, you can get a legit Rebel Swarm. So if you've wanted to do that, and let's face it- every one of us who favors the Firebird over the Gear has looked over at the other side of the table at all those TIEs stacked up and wondered what it'd be like to try just once, you've finally got your chance to do just that. 12 points for a ship with twos all the way down isn't bad, but what has the internets abuzz with the Headhunter is that missile icon in the upgrade bar. Where the A-Wing was just a hair too expensive to justify solely as a missile delivery platform, the Z-95 totally isn't. When I saw the cost of the ship and the Missile icon, the old Imperial Guard player voice in my head kicked on and said, "Man. If only they had a cheaper missile you could stick on this thing. Wouldn't that be something?" Then it started quoting all the Commissar lines from Dawn of War and I got a little sidetracked, but when I stopped shouting "WHO IS WITH ME? ", to no one in particular in the smoke shack at work, I scrolled down the page and clicked the link for the Ion Pulse Missiles. As excited as I was at the notion of having an ultra-cheap Rebel fighter, Ion Pulse Missiles tripped me out, big time. Dig on that for a moment- 3 points, 3 Attack dice. Range 2-3. Range 2-3? On this monster of a card? So far so good, right? Check out the rest of that- if the attack hits, blah, blah, blah, 1 damage and 2 ion tokens. Wait, what? 2 ion tokens? Yup, you read it right- this thing has the potential to ionize a big ship in a single salvo of shots. Last thing about the Z-95, note there's a couple of Elite Pilot Skill cards that are new as well (one looks like it might be called "Wingman", the other, I don't know- "Deceive", maybe?) 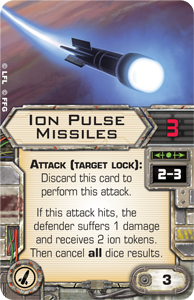 and some other card that looks like it might say, "Munitions Failsafe." As it has no symbol in the lower left corner, I'm assuming it's a Modification. Is it going to be as awesome as we think? Who knows- as we've found in the past, the maneuver dial means so, so much. Still though, assuming it's not just absolutely terrible, I think FFG is going to be selling a lot of these dudes. I could see this ship selling out pretty fast, pretty easily. The other ship that got the partial reveal treatment was the E-Wing. Now, not being a huge fan of the Extended Universe stuff, I'd heard of E-Wings, but wasn't like intimately familiar with them or anything. The E-Wing looks to be an upscaled X-Wing in terms of maneuverability as it's got a 3 where the X-Wing only has a 2 for Agility, while the Shields and Hull value are swapped, which is almost a wash, but obviously favors the E over the X. While a generic pilot was revealed for the Z-95, the E-Wing reveal included a named pilot. Lots of information to take in here- that's a lot of points for a PS5 pilot, this thing has a ton of Actions available (this guy is just BEGGING to be given Push The Limit, am I right? ), it can take Astromechs, Torpedoes, and Advanced Systems! Wow! He already costs 32 points, but how easy would it be to stick another 10 or 15 points on this in upgrades and stuff? 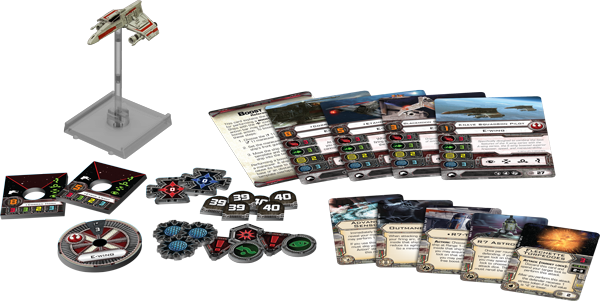 And hey- they even included a new Astromech! So that's fairly interesting, right? Enemy staring you down at 1-2, you can use your R7-T1 Action to TL him then Boost? I mean, yeah, it comes with the E-Wing and I'm sure it works great there, but imagine sticking this on Wedge or Biggs? Why stop there though- what about on Dutch Vander? Hey now! Staring hard at the picture of the cards and stuff, there's other interesting stuff in the box it looks like. 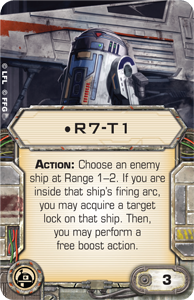 In addition to R7-T1, it looks like there's a generic R7 droid, a new 2-point Torpedo called Flechette Torpedoes, and a new Elite Pilot Skill that looks like it's called, "Outmaneuver." I'd originally planned on talking about the Phantom and the Defender at least a little in this article too, but this article has gotten much longer than I'd originally planned up to this point, so let's save those for tomorrow shall we? Gotta say, as excited as I was for Wave 3, Wave 4 seems much more compelling at this point. Who knows when they'll actually turn up in stores (man, we're waiting on a lot of stuff to actually show up in stores, huh? ), but when they do, it's gonna be good times, no? Bikini Battle Basics- Shields Explained!